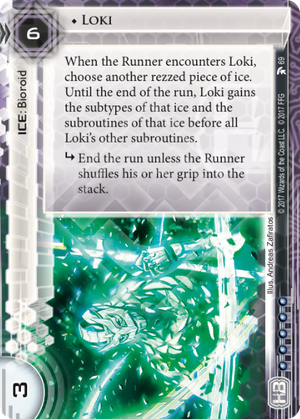 When the Runner encounters Loki, choose another rezzed piece of ice. Until the end of the run, Loki gains the subtypes of that ice and the subroutines of that ice before all Loki's other subroutines. subroutine End the run unless the Runner shuffles his or her grip into the stack. If the Runner has zero cards in grip, can they still choose to shuffle their grip into the stack in order to keep Loki from ending the run? Yes, as long as there are at least 2 cards in the stack that can be shuffled. If Loki gains a subroutine with a self-reference from another piece of ice, such as a trap like Kitsune, what happens? Everything in the subroutine resolves as normal, except for any effect with a self-reference in it. The reference does not refer to Loki, so it cannot resolve. If Loki gains a subroutine from a Mausolus with 3 advancement tokens on it, does the regular text resolve or does the parenthetical text resolve? Loki gains the subroutine text but not the ability text that says to resolve the parenthetical, so only the regular text will resolve. Even if Loki were to somehow copy the other ability, it would contain a broken self-reference and thus would not work either. If Loki gains the subroutines from NEXT Gold, what are the values of X? Loki does not have any way to set the value of X, so the subroutines do 0 net damage and trash 0 programs. If the Corp chooses a NEXT Opal or NEXT Silver for Loki's ability, how many subroutines does Loki gain? When Loki's ability resolves, it gains the subtypes and subroutines of the chosen ice simultaneously, so Loki is not counted as a rezzed NEXT ice until the ability completes. Loki gains as many subroutines as the NEXT Opal/Silver had before the ability began to resolve. If the Corp chooses a Hive for Loki's ability, and then the Corp forfeits a False Lead during the encounter, does Loki gain another subroutine? No. Loki only gains subroutines at the time that its "when encountered" ability resolves. What happens if the Corp chooses a deflector ice (Bullfrog, Mind Game, Susanoo-no-Mikoto) for Loki's ability? Most deflector ice change the Runner's position "instead of passing" that ice. In these cases as well as the case of Bullfrog, the subroutine gained by Loki contains a broken self-reference, so the Runner is not deflected because the Runner will not pass the named piece of ice. What happens if the Corp chooses Cell Portal for Loki's ability? Cell Portal only uses a self-reference for the "Derez Cell Portal" part of its effect. The copied subroutine will send the Runner to the outermost piece of ice protecting the attacked server (usually the server Loki is protecting), but nothing will be derezzed. If Loki is encountered again later in the run, Loki will still have Cell Portal's subroutine, in between the printed subroutine and any subroutines gained by the second resolution of its "when encountered" ability. FFG has a bunch of ways to weaken too strong ice such as making it unique, making it cost 5 influence and making it expensive to rez. Guess what, that's what Loki is: unique expensive HB-only ice. It'd better be worth it if it's to see any play at all. And it is. Loki is bioroid ice that can't be clicked through, meaning it can be used with all the bioroid support cards of HB without having any of the typical downsides. There's one sub that may as well say "End the run" as most runners will only go empty grip in a make-or-break run. But because of the wording Endless Hunger doesn't work on Loki. Of course the real value of Loki is in the on encounter ability. Point to a rezzed piece of ice and Loki the subtypes of that ice but more importantly the subs. I guess everyone first thinks of mythic ice, but I see more practical value in bioroids. Bioroids tend to be efficient but porous due to the runner being able to click through them. But the text that allows the runner to click through subs is located outside the subroutines. Thus if Loki copies the subs the runner will not be able to click through them. The big problem however is that Loki has strength 3, which is easy to break with most breakers. However consider a Spiderweb. That's a barrier with 3 subs and strength 2. If Loki copies the subs it becomes a 4 sub with strength 3 barrier of which the runner needs to break 3 subs and wants to break 4 subs. A 3 strength 4 sub barrier costs 4 to break with Paperclip and 5 with Corroder. Other good barriers are Battlement and Eli 1.0 / Eli 2.0. In the sentry department we have Cobra, Errand Boy, Ichi 1.0, Negotiator, Pup, Rototurret, Shadow, Swordsman (though it may be better when encountered directly if the runner has an AI), Tsurugi, Veritas, Vikram 1.0, Zed 1.0/Zed 2.0 (if Loki is behind click-through ice). And for code gates there are Aiki, Authenticator, Bloom, Datapike, Enigma, Fairchild 1.0/Fairchild 2.0, Harvester, Herald, Hourglass, Hudson 1.0, Inazuma, Interrupt 0, Macrophage, Ravana 1.0 (if you really want to go crazy), Viktor 1.0, Weir, Yagura. Of course there is many more ice and there's plenty of argument why some ice combos well with Loki and other doesn't. The ice I have highlighted is roughly ice that's either cheap or medium cost in combination with an annoying restriction that makes it work better on Loki despite the low strength and that in any case has multiple subs. I've excluded some ice like Archer which is very costly to rez (i.e. forfeit agenda or bad publicity). By no means is this list exhaustive however and I look forward to suggestions about other cards that work with Loki. Because Loki works so well with a lot of cards it's very flexible. If you have a barrier, sentry and code gate rezzed you can determine during a run what would be most taxing for the runner. For example if you know you have a code gate behind Loki and the runner has a Gordian Blade you may decide to make Loki a barrier. Or if you see the runner has only a trash-to-use killer you may want to make Loki a sentry to get rid of that killer. It's this flexibility and the potential for being a 3 or 4 sub ice that makes Loki worthwhile. Because of the low strength Loki is vulnerable to ice destruction however, so keep that in mind. Oh and if you happen to run a HB Sandburg deck Loki should fit in quite well. EDIT: A previous version of this review said Hive works great with Loki because the subs don't go away when used on Loki. This is incorrect. Thanks Toper for pointing that out. Unfortunately the really fun places to do this tend to be Jinteki (White Tree, AgInfusion) which is a pretty huge influence hit. AgInfusion especially could be really fun since you can just send them at the Loki server over and over and over and vary which ICE you use with it based on what their current setup is. The White Tree approach is a little more boring...just force them to run the specific central of your choice if they want to see any of your remotes. I guess you could do something like Wormhole or Susanoo-no-Mikoto to try and force them into an Excalibur subroutine, but influence starts tightening up pretty quick. ...also wait, that top ruling means you can use Loki as a repeating trap since the trash effect traps generally come with doesn't happen. There are a few hoops to jump (rez the trap without trashing it, prevent the Runner from running the trap in order to trash it) so this probably all falls into the Grade A Jank bin. Let's have a quick look at all the traps, shall we? Data Mine: One net damage. Meh. Howler: This seems promising...you can spew bioroids everywhere and- oh, wait, the install ability self-references so it won't work. Sad. It's a Trap! : "Trash 1 installed card" tax for each run of the server. Might be alright, but for such an amount of setup this feels lackluster. Kitsune: You can do a stupid Haarpsichord trick where your remote is literally just Loki and you have this stashed somewhere else, then when they try to run it you feed them a low scoring Agenda to protect the higher scoring one currently in the remove. A lot of moving parts, though. As a bonus, if they try to run at Kitsune to get rid of it you can just not choose a card in HQ and Kitsune won't trash, so you can always just do more basic stuff like throwing them at HQ traps. Lab Dog: Trash a hardware every run. Meh. Good chance of whiffing against a number of decks, and even against decks with some hardware the Dog itself would probably do fine. Special Offer: 5 credits per run? It's not terrible, but it's probably not worth the investment either. Universal Connectivity Fee: Now we're talking. It's probably STILL not worth the setup and the requirement to keep your Fee from being trashed, but at least the payoff looks cool: Slap Loki behind Data Raven and the cost to get past Loki is suddenly "all your credits and your entire hand". Ouch. You'd have to dedicate your whole deck to setting this up in a way that's useful, though, and since it falls over to AI that's pretty meh. Whirlpool: If you're triggering this more than once in a game, you're doing it wrong. Also, am I the only one that noticed that Loki's natural subroutine stops Faust dead in his tracks? That seems kind of neat flavour-wise. The Runner must be prevented from jacking out. This requires the resolution of Whirlpool, Labyrinthine Servers or other shenanigans. The Runner must not break Loki's subroutine, which is difficult due to its low strength. Patch, Red Tape, Sandburg, Helheim Servers, Rover Algorithm or other shenanigans can help with this. There needs to be a rezzed Cell Portal on the board, which requires manual rez techniques like Executive Boot Camp, Oversight AI, Eliza's Toybox or other shenanigans. Otherwise, the only other way to do this is to have the Runner run Cell Portal and break its subroutine, which by definition means they already have the breakers they need to break Loki. There needs to be ICE preceding Loki that make the entire enterprise worth it. Errand Boy is often the one cited here, but in-faction options (and you won't be running Loki out of faction) include cards like Architect, Minelayer (for the ever-growing server! ), Howler, or other shenanigans. Out of faction shenanigans include the classic Komainu murder option (as Komainu gains more subroutines upon its second encounter... or honestly, why didn't you just target this with Loki), the much cheaper Pup murder option (just keep running them past Pup until they can no longer pay for it and die), Herald for free advancements, Executive Functioning for a more unorthodox death... the list of shenanigans is pretty long, and most of what I've listed here are cheaper and more feasible options for jank that already has a lot of moving parts. In conclusion (for now), Loki removes one piece of the massive Rube Goldberg machine that is the Cell Portal Infinite Loop Combo, removing the requirement for Cell Portal's repeated re-rezzing. However, the limitations listed above still exist. Even so, with the proper setup, Loki can be an unexpected game winner. Cell Portal is rezzed, through any of the shenanigans involved. Let's say it was done with Oversight AI. The Runner makes a run on our example server. It has Loki in position 0 and Pup in position 1. Why they would make a run on a two-deep server with inadequate icebreakers is beyond me. But maybe it's because you made them An Offer They Can't Refuse? The Runner encounters Pup, and pays through it in blood or credits. The Runner encounters Loki, who takes upon the subroutines of Cell Portal. Let's say in our example that they can't break it, because of all the Patches you applied. The Runner encounters Loki, which just for fun, takes on Pup's subroutines. Repeat ad nauseam. In setup, 3 and 1 to install the relevant ICE (less, of course, with shenanigans). 1 and 1 to play Oversight AI, to rez Cell Portal. Any number of , up to 3, to install Patches should you need to. In action, 1 and 4 to play An Offer You Can't Refuse. 1 to rez Pup. 6 to rez Loki (less with shenanigans again). Leaving the setup aside, which can be done over many turns, the maximum credit cost needed to fire off this combo in one is 11. Less, if you decide to rez Pup or Loki early with shenanigans. This is a lot less than the old Infinite Loop used to cost, what with the constant re-rezzing of Cell Portal. Despite the hefty setup costs, the addition of Loki into the game has created a cost for this loop that is actually... semi-feasible... okay, maybe not the most feasible thing in the world, but still much more achievable than it used to be! 8 with Patches, 13 all up, plus 1 more and if you shenanigansed Loki faceup with Oversight AI, one less if you did it with Executive Boot Camp, and 3 more plus 4 if you did it with Eliza's Toybox. You see what I mean about the math? Without Patches, and assuming the Runner can't break Loki, the price goes down to 5 and 13. Obviously the setup would be put together as cards come into your hand, so think of this cost as being spread out over several turns. Making these numbers work is not outside the bounds of reality! Fine let's assume you also have a Labyrinthine Servers token to use. That brings our cost up by 6, barring shenanigans, and 5, plus the risk your agenda would be stolen. Not recommended. Alternatively, you can throw a Whirlpool into the server, which ups our cost by 1 and 2 for the install (again, barring shenanigans). More feasible and it brings our cost up to 6 and 15, which still doesn't look too bad. In double conclusion, I'm an idiot but thanks for sticking with me anyway. Pretend that I made no mistakes. tl;dr - long rant and analysis about how Loki has changed the feasibility of the Cell Portal Infinite Loop Jank. It's made it cheaper and removed some of the moving parts but it's still, uh, pretty bad. Works well with mythic ice if the runner has no AI. As it cannot be clicked to break, it makes running first click, with just a killer installed, more hazardous for the runner against HB. If Loki chooses Next Gold the sub does zero net damage; but presumably that still triggers Tori Hanzo or Clan Vengeance if it fires.